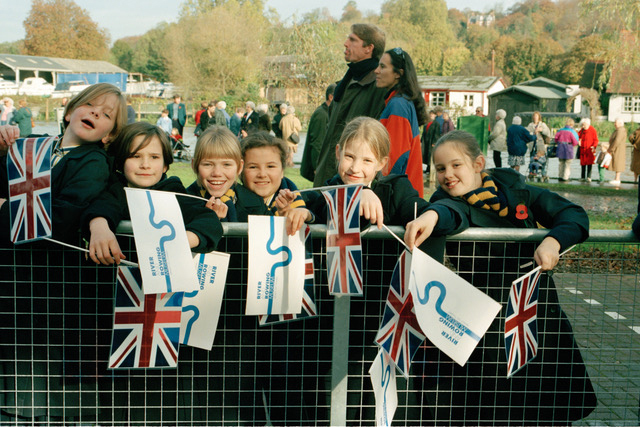 HM the Queen opened the River & Rowing Museum officially on 6 November 1998. Founder Chris Dodd recalls a thespian occasion when his dream came true. Although rowing as sport has never really caught on with the House of Windsor, the monarch’s watermen have provided transportation for royal folk for centuries, particularly between palaces and noble piles on the Thames. They were present at Runnymede during King John’s confrontation with his barons over Magna Carta, and today the Queen’s Bargemaster and his 24 watermen (most of them Doggett’s winners) receive a salary of £3.50 per annum to be responsible for safe passage of the regalia for the State Opening of Parliament twixt Buckingham Palace and Westminster. How did he tame this royal band? Needless to say, the trustees were delighted when HRH Queen Elizabeth accepted their invitation to open the RRM’s doors officially on 6 November 1998. Fittingly, she landed at the museum’s pontoon after a voyage from Henley town aboard a launch manned by her scarlet-liveried watermen. Waiting for the Queen. Photo: Catherine Shakespeare Lane. 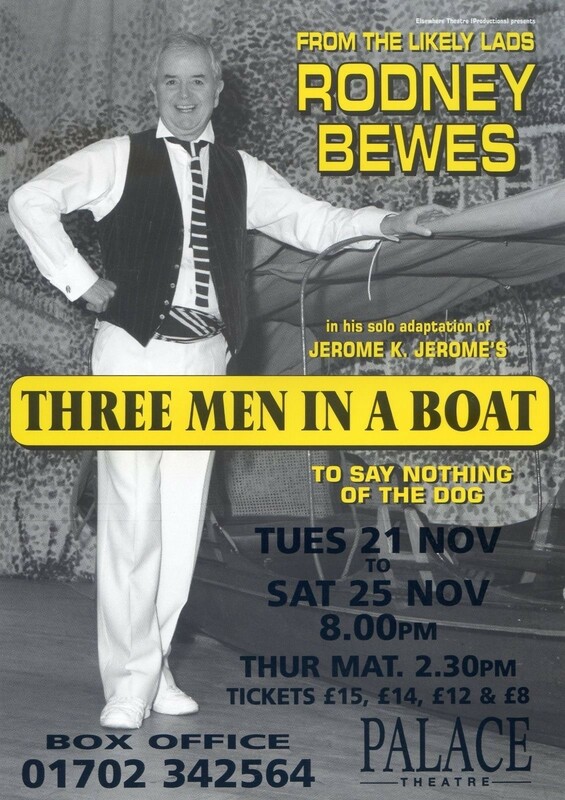 After introductions, presentations, due declarations and a tour of the galleries, the monarch sat down for a performance of Three Men in a Boat by actor Rodney Bewes, who was touring his adaptation of the classic story around the country, accompanied by a skiff full of props and Montmorency, the Dog. Montmorency was pissed off because his hopes of tormenting the Queen’s corgis were dashed when none turned out with the royal party. Rodney, a keen oarsman, punter and skiff-shover, who annually tethered his boat to the booms to watch five days of racing at HRR, the regatta that enjoys Mrs Windsor’s patronage, was simply pissed; overwhelmed by the occasion. The be-blazered and be-suited shifted their feet in anxiety as they willed the former Likely Lad to remember his lines. Not forgetting the Dog whose look said it all: Rodney and the assembled company could all get stuffed. The Queen, Montmorency and Rodney. Photo: Catherine Shakespeare Lane. It was not the most refined performance of Rodney’s crafty and lively take on Three Men, but the old pro found his voice and got away with it. There was an audible sigh of relief. 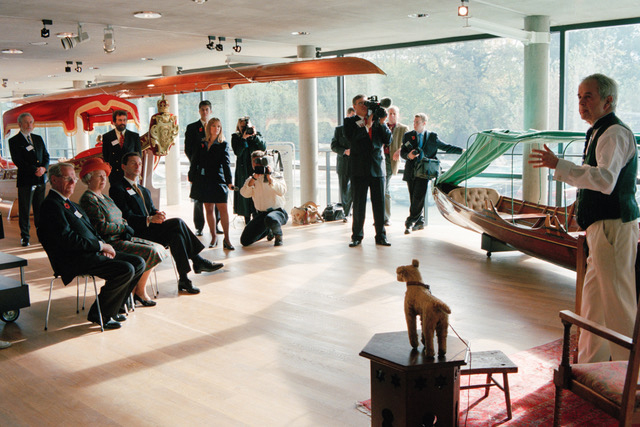 And on that sunny day of 6 November 1998, the River & Rowing Museum was declared officially open. Thanks to much hard work and inspiration by dozens of people, my dream came true. Happy Coming-of-Age, R&R!